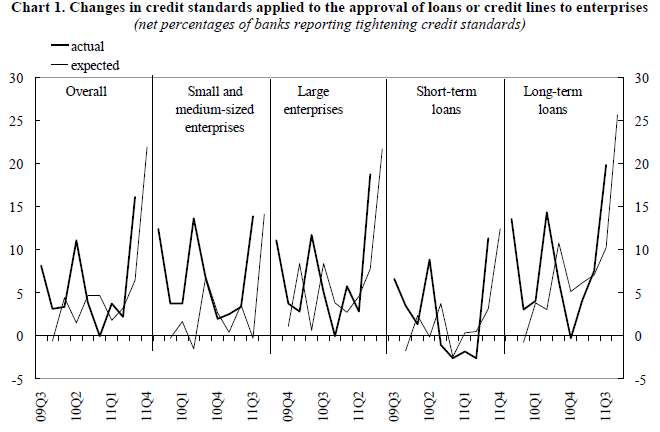 Having looked at the tools available to the ECB, at its balance sheet, and at the transmission of monetary policy into the interbank lending market.after considering financial market failures due to Fractional Reserve Banking, overlending and VaR, I would like to turn my attention to the less orthodox interventions of the ECB. To this end I will spend the next few lines discussing the Covered Bond Purchase Programme, before looking at the Securities Market Programme. Covered bonds are debt securities issued by MFIs that are characterised by the fact that they are collateralised with “safe” assets, such as government bond, mortgages, etc. A formal legal definition can be found in the European Commission regulation, from July 20, 2011, according to “Part Three (Capital requirements), Title II (Capital requirements for credit risk), Chapter 2 (Standardised approach), Section 2 (Risk weights) under article 124” (slide 128). The European Covered Bond Council provides extensive information about this type of assets in its Fact Book. 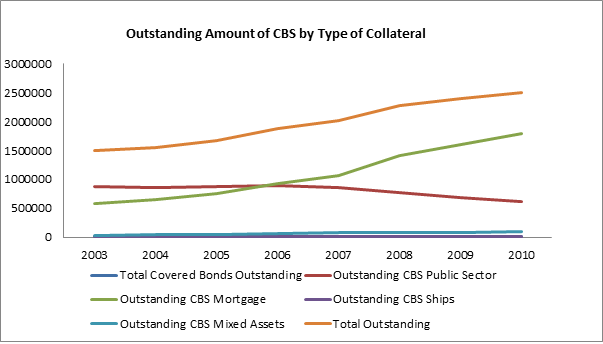 The figure summarises the evolution of covered bonds in the last 8 years, according to the collateral used. The Covered Bond Purchase Programme (CBPP) was a programme announced on May 7, 2009, on the basis of article 18 of the ECB statute. It has been in operation during two periods. 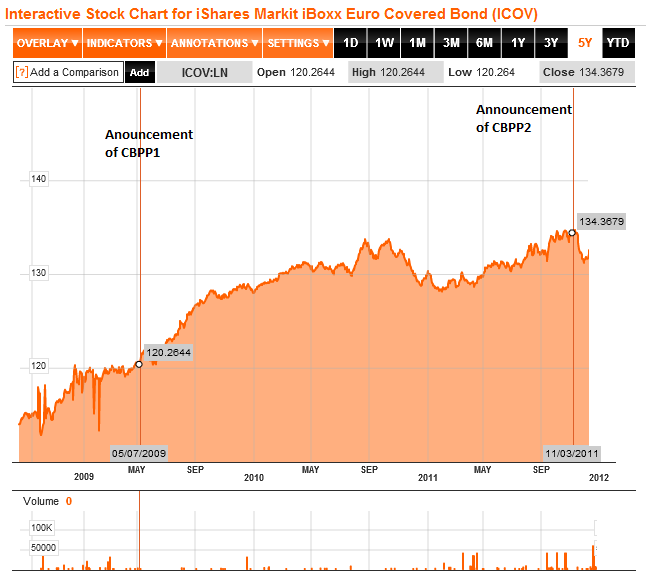 The ECB first intervened between July 2009 and June 2010 (CBPP1), during which time the ECB outright purchased €60 bn of covered bonds. On October 6 2011, the ECB announced it would reactivate the programme (CBPP2) and that it was intended to amount to €40 bns between November 2011 and October 2012. On November 3, 2011, the ECB announced further details about maturities, eligibility and counterparties. The covered bond market was also perceived as relatively safer market to intervene in due to the relatively smaller risk associated with the collateral used for covered bonds, relative to, for example, Asset Backed Securities (ABS). Mechanics – How does the CBPP work? In my opinion, it is less important what you call it than what it is. Through the CBPP, the ECB purchases covered bonds, both in primary and secondary markets, in order to provide liquidity to the financial sector. 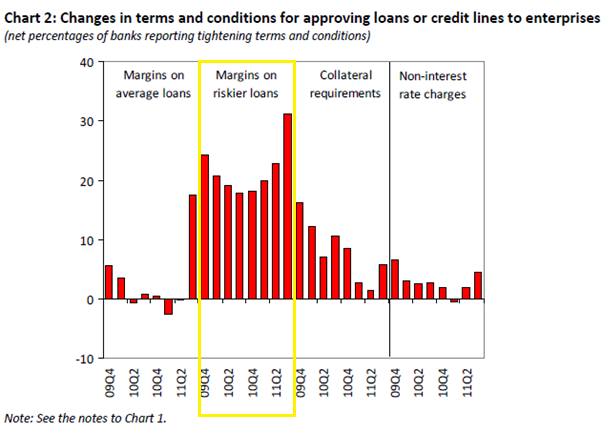 To limit the inflationary effects of those purchases, the ECB then sterilises these open market operations by auctioning fixed term deposits in order to stop the banking sector from increasing its loans to the overall public and increase inflation. To the best of my understanding this is QE. The following figure provides a simplified description of the ECB balance sheet mechanics of the CBPP. It is inspired by these blog posts from Professor Buiter (here, here and here). “T” stands for treasury (sovereign debt) bonds, “P” stands for private securities (such as stocks, ABS, or indeed covered bonds), “L(T)” stands for loans to the private sector secured against “T”, “L(P)” stands for loans to the private sector secured against “P”, “X” stands for foreign reserves, “M0” corresponds to the monetary base (i.e. : money in circulation and bank deposits), “N” are the non-monetary liabilities of the ECB (such as CB bonds and bills) and “W” corresponds to net wealth, or equity, of the ECB. 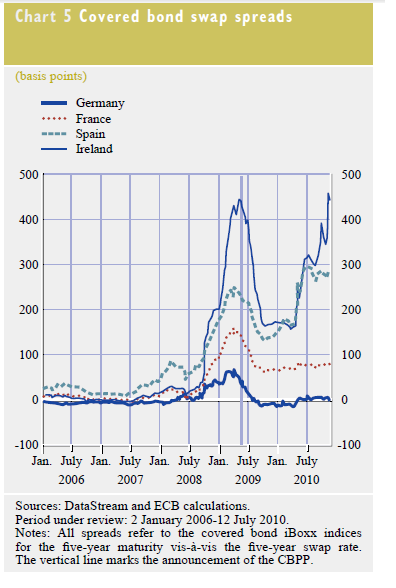 The figure shows that a purchase of securities by the ECB leads to an increase in the monetary base. One last important feature is that although the CBPP was decided by the ECB, it is implemented by national central banks. 1. The authors show that in the primary market, the CBPP led to a substitution in the issuance of uncovered bonds by covered ones. This is likely to be due to the fact that the intervention of the ECB made them safer, which goes a long way to prove that the intervention was successful. These results are arrived at by estimating equilibrium relationships in the Covered Bond Market through cointegration analysis. The authors provide tables for the estimation of a simple Error Correction Model (ECR) with 1 lag and 1 explanatory variable. Given the information available and the tests conducted, the results seem to be robust. Having estimated this relationship, the authors then use what is known as an event study to check whether the difference between covered and uncovered bonds reverts to equilibrium with the introduction of the CBPP. As the figure below is highlighted to show, there was indeed an upwards change in the negative path of the relationship back towards its long term equilibrium which coincides with the introduction of the CBPP. A similar change did not happen in the relationship between corporate and (total) bank bonds, implying that the CBPP’s effect was limited to the banking sector. 2. The authors then study effects of the CBPP on the secondary covered bond market. First, they consider the immediate effects. They show that the CBPP led to a sharp fall in spreads between the covered bond iBoxx indeces and the Swap rate during its first week of operation. Their analysis shows that this fall was a specific feature of Euro-Zone markets that did not take place in the Sterling markets. 3. Finally, the authors study the longer term effect that the CBPP had on the covered bond yields. To do this they study the changes in the spread between iBoxx country indeces and the debt yields of national agencies which the French and German governments individually guarantee. 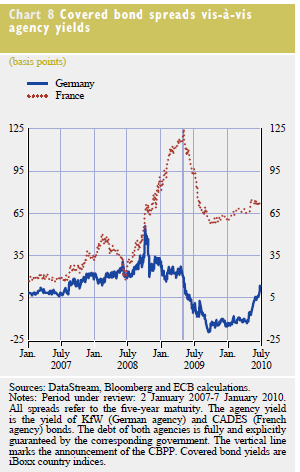 As the figure below shows, the effect of the CBPP on yield spreads was particularly visible in French financial markets, but also in German ones, bringing them down. The second account complements this aggregate view by comparing it with specific banking developments in Spain, Italy and Portugal. In report by Barclays Capital, unfortunately unavailable to the public but described by FTAlphaville, its researchers highlighted the diversified impact that the CBPP was having on Euro-Zone member states. It would seem that the brunt of the intervention took place outside of the periphery. This would make sense as Germany and France represented over 38% of the Covered Bond market. 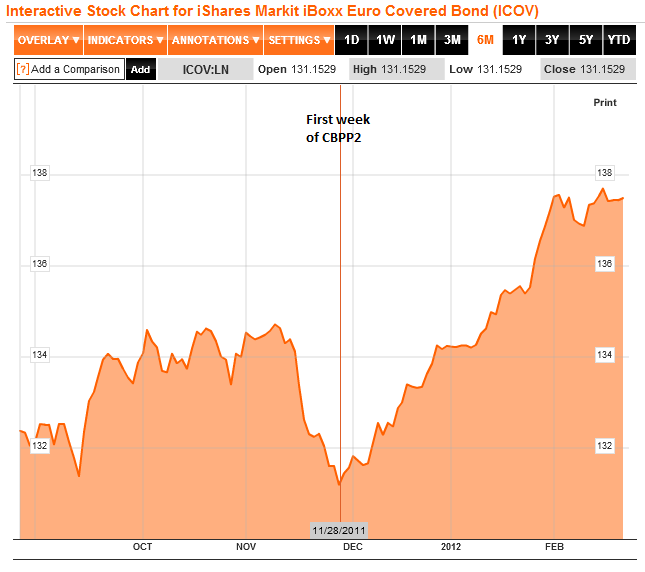 Thus, the first intervention in the covered bond market ended on June 30, 2010, as planned. Whether this was appropriate or not is arguable. 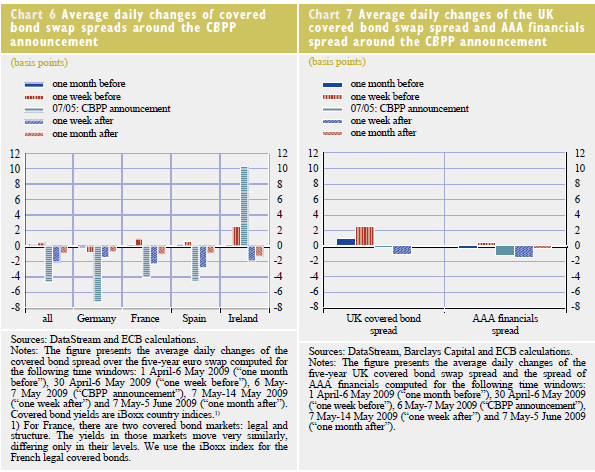 Indeed, at the end of the coverage in Charts 5 and 8 and of figure 1, spreads increased again, ahead of the end of the CBPP1. In retrospect, the reintroduction of the CBPP2 seems to point in the direction of it having been premature to end the programme in the first place. This would imply that the covered bond market was yet again disrupted. However, the form of this disruption was not clear. Neither Unicredit, nor Dansk Bank discussed any specific problems with the covered bonds market. 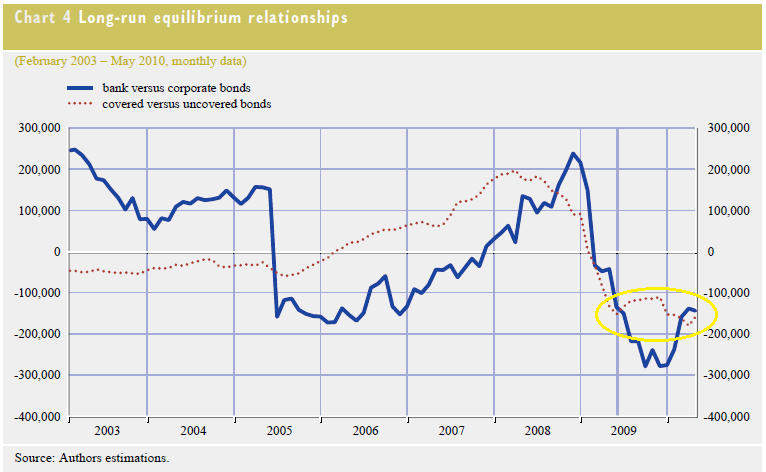 Notwithstanding this, there are two possible reasons for the renewed intervention of the ECB. While confirming the relative, success of the CBPP1, unfortunately the figure above does not quite fit the hypothesis that on aggregate terms the Euro Covered bond market was going through any sort of trouble similar to the one preceding the introduction of the CBPP1. Clearly this figure provides very incomplete insights into the actual market conditions. It fails to shed any light on the specific national conditions of this market and it fails to take the swap rate into account. Nonetheless, on the face of it, there’s little evidence for the ECB to intervene. However, there’s another potential explanation. 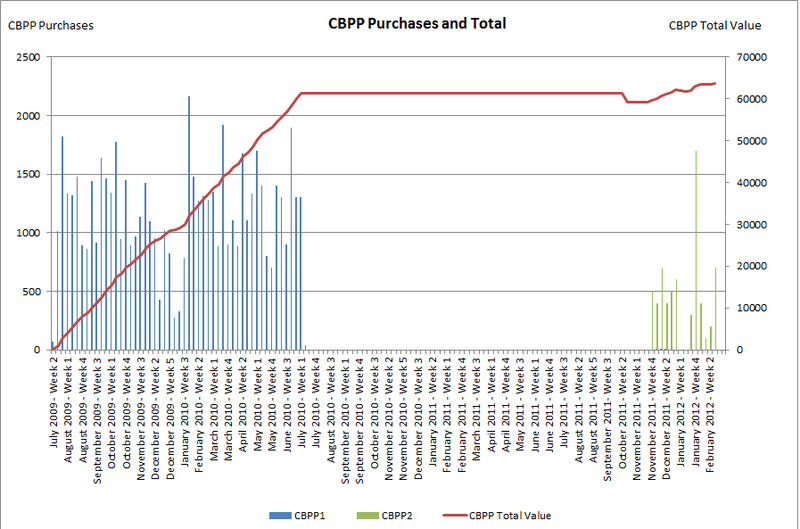 It is difficult to say whether the CBPP2 is having the desired effects on the market. 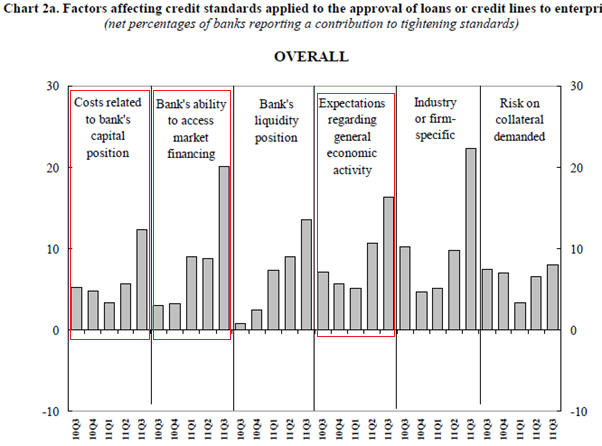 Bank lending surveys conducted prior to the introduction of the CBPP1 showed that lending conditions were already improving, so it is difficult to pin the continued improvement in Q2 and Q3-2009 to the introduction of the programme. 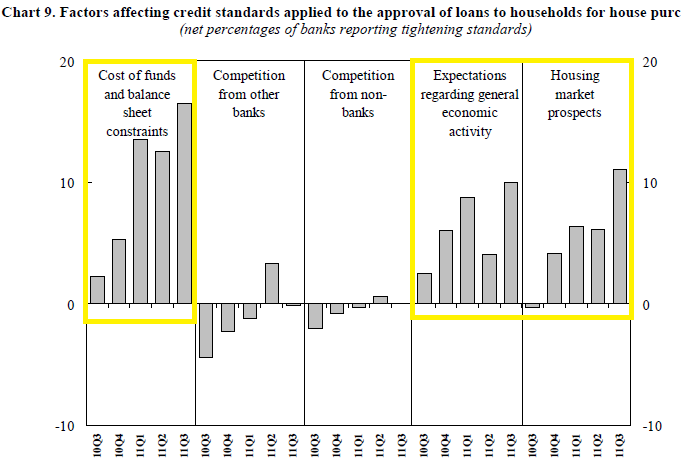 Similarly, according to the Q1-2012 Bank Lending Survey, lending conditions did not improve, following the introduction of CBPP2. These observations are consistent with the facts described in Beine et al (2011)’s Chart 4. However, returning to the iBoxx Euro Covered bond index, the resumption of the CBPP2 by the ECB seems to have triggered a market rally. 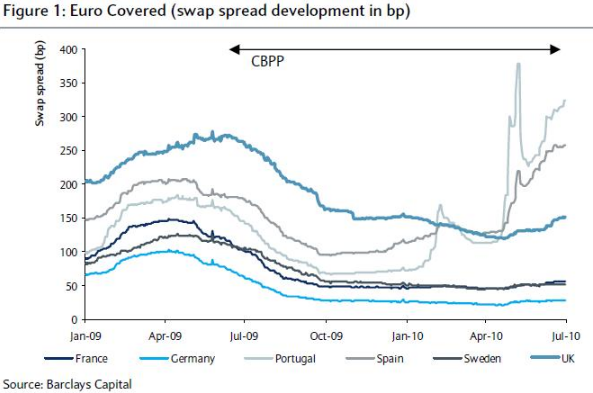 How representative this is of every Euro-zone country and how this is impacting the swap spread, is an unknown. All in all, the evaluation of the CBPPs is mixed and yet uncertain. While the first instalment was successful on the aggregate, there seem to be some evidences that it failed to aid smaller but more cash-strapped banking systems. 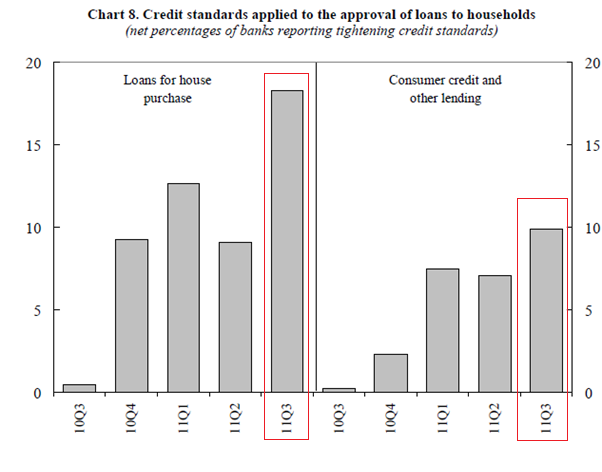 Regarding the second intervention, while it failed to immediately stem the contraction in private credit markets, it may have been able to expand aggregate covered bond holdings and issuances much as it did in the first instance. More time should provide better information and processing of the unfolding events. This entry was posted in Aides Memoire, Banking, ECB, Economic Concepts and tagged Bank Lending Survey, Banking crisis, CBPP, CBPP1, CBPP2, Cointegration, Covered Bond Purchasing Programme, Covered Bonds, ECB, France, Germany, iBoxx, iShare, Italy, Monetary Policy Transmission, Portugal, Spain, Stabilisation. Bookmark the permalink. And thanks for the post, btw. I will make sure to join your Linkedin group. Like I say on the post, you are interested in the period between June 2009-July2010 and between November 2011 and October 2012.